Alex Savage, who brought us the excellent short film Swanky Swizzy, is back with his latest offering, Orange Crush. 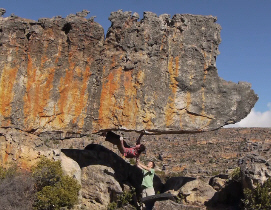 Featuring over 20 problems of all grades from Rocklands, South Africa, Orange Crush is a well edited, no frills bouldering video that has “no interviews, no beta spray, just climbing.” If you love bouldering it is sure to get you psyched to get out climbing*. The catch, if there is one, is that downloading and watching the 30+ minutes of Orange Crush via the Savage Climbing website will cost you $5. While free is always the most popular price, to me $5 is a small price to pay to help support people out there putting together high quality media like this. Indeed, despite the fact that Alex sent me a copy for free to review I still went back and paid for a copy to show my support. Check it out and share your thoughts in the comments. *I know it did for me since I changed my plans after I watched it yesterday so I could go get a session in at the gym. I checked it out. Great HD footage, and a lot of problems I’ve never seen before. Though these guys aren’t on the cutting edge of difficulty, they’re still climbing some nails hard problems. I enjoyed seeing uncut footage of the actual sends, and none of those overly-edited, chopped clips of climbers essentially posing on routes/boulder problems. Good little vid, worth the $5. I really like the unedited, pulled-back, single angle rock & climber shots that Alex Savage uses. Walker Kearney, too. It’s such a cool way to watch a climb in a video. Seems realistic and immediate. Great videos. Between the Trees / The Outsider do the same thing. I love it. You know what… I don’t really get what all of this recent “uncut footage” hype is all about, it’s kind of annoying really. Unless there are no witnesses to a send and the only proof a climber can provide is some uncut footage, it’s not necessary nor is it as pleasing to the eye as watching a skillfully edited video of a climber on a route/boulder. So what if the climber is “posing” on a route or boulder. It’s not like they haven’t sent it, and so it doesn’t take away from their achievement. The way I see it is that the film maker trying to relay the FULL experience and magnitude of the spectacular achievements to our couches. That being said I do enjoy uncut footage as well; for a lot of climbs, especially boulders it just works. I’m downloading Orange Crush as we speak and I am looking forward to it. Maybe there should be an “uncut reel” available from filmmakers along with the polished “cut” version for the masses? P.S. This is not meant to be a personal attack on the previous commenters. Everyone is entitled to their own opinion and we all have different tastes. Sid, for me, seeing the uncut actual send footage isn’t about seeing proof of the ascent. It just makes better viewing, in my opinion. You get to see the climber absolutely psyched as they finish the route or boulder problem. Come to think of it, it isn’t so much uncut footage that I like, but footage of the actual send. Just to give an example, there’s a video floating around (it’s probably on deadpointmag or maybe even on this site) of Paul Robinson climbing dreamtime. He climbs the first part, then there’s a cut, and he’s quite obviously doing the traverse along the lip on a different go, then he doesn’t even do the top-out (it looks to be covered in snow). It’s just totally uninspiring to watch. To be clear, I have no doubt that Paul sent dreamtime, and that he’s a sick climber, one of the best boulderers on the planet. On the other hand, watch the footage of Paul sending El Corazon in the Progression extras. It’s freakin’ amazing! He practically loses it after topping out. Sweet trailer. Downloading presently. Damn you slow downloads!